“We have no problem with getting more money into the pockets of our members. Charming, right? That’s Newark Teachers Union President John Abeigon giving you a crystal-clear peek at his priorities: adults over schoolchildren. But there’s a line, right? Even union aficionados like my parents might find Abeigon’s rhetoric a bit overblown, his actions a bit dodgy, his dismissal of the needs of Newark schoolchildren and the choices of their parents a bit cavalier and at odds with NTU’s claim of progressivism. As he’s told us himself in an interview with Chalkbeat (from which the opening quote was taken) he sees his role as defending grown-ups, not kids. As I said, that’s fine. But as a public service — to Gov. Murphy and anyone else vulnerable to Abeigon’s counsel — let’s dig a little deeper into the union president’s philosophy and where his loyalties lie. 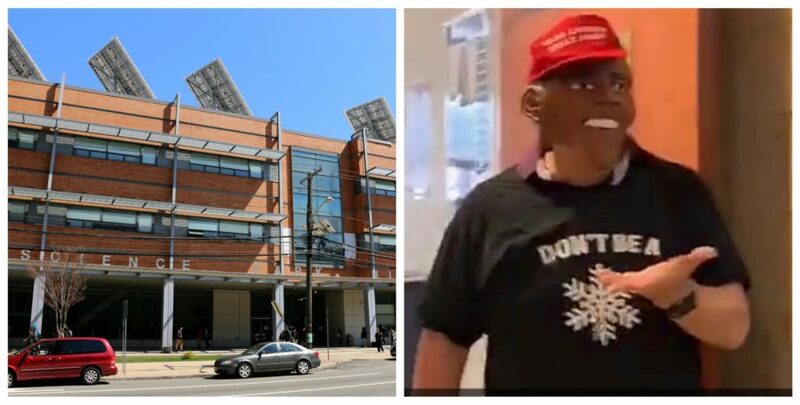 But what does he have to say about the white teacher at Newark’s prestigious (and traditional) Science Park High School who this past Halloween wore a mask of Barack Obama – which some parents and students regarded as blackface — accessorized with a MAGA hat and a black T-shirt with the words “Don’t Be A” with a picture of a snowflake? Should he be “isolated and let go” like those “associated with education reform”? And I have my own questions, actually too many for one blogpost. So I’ll restrain myself to two items: Abeigon and NTU’s practice of protecting bad teachers by funding lawyers who (mostly) get them off on technicalities (seems like NJ’s tenure reform isn’t working so well) and Abeigon’s extra-curricular activities. Based on the findings, Ms. Wilson was in the classroom while male and female students engaged in inappropriate physical activity, which included looking at and touching one another’s genitalia. Although Ms. Wilson claims that she knew nothing about the incidents that took place in her classroom during instruction, students attested not only to her presence in the classroom, but that on some occasions she addressed students’ behavior and warned students about actions that were linked to nasty team and nasty game. As such, I recommend the District pursue tenure charges for termination against Ms. Lydia Wilson for neglect of duty that allowed students to engage in sexually explicit behavior. NTU lawyers represented Wilson during arbitration and argued that the investigation had been procedurally improper. The arbitrator agreed and ordered Wilson back to the classroom with full back pay and the suspension expunged from her record. Iman Jones, a first-grade teacher at Hawthorne Avenue School, was accused in 2017 of poor judgement as well as wanton and careless disregard for her students’ welfare after a student took a razorblade from her desk and slashed another student, who required sutures and stitches. At the time of the slashing, Jones was chatting on her cell phone in the doorway of her classroom. The NJ Department of Children and Families conducted an investigation and concluded that Jones’ behavior rose to the level of neglect. The district tried to fire her so Jones, with the backing of NTU lawyers, went to arbitration. The arbitrator ruled in her favor; while the district “had established the truth of its conduct unbecoming charge,” it failed “to establish such by a preponderance of the evidence.” Charges were dismissed and she went back to her position with full back pay, seniority, and benefits. So progressive union leader John Abeigon spends his time overseeing defenses for white teachers to wear black face and neglectful teachers to stay in the classroom with vulnerable students.. (He’s well-compensated for his trouble: According to NTU’s most recent 990 form, Abeigon’s NTU salary is $197,214.). He also spends a least some of his time at a little club called Club Espana. Wost place I have ever went to, the place looks like a craphole. The people were rude, the only person that was nice to me and my wife was the bartender.i dont remember the bartenders name I just know he is named after a sangria, but i thought I would give the place another shot but when we came back the people were yelling and screaming, and it was very annoying, but there was a bald gentleman who looked like he was in charge threatening to kill the bartender, and trying to go after him. The only reason he was going after him was there was no music on, then when the gentleman left, I never have felt uncomfortable at a club in my life, I pray to God that the bartender will be alright. I didn’t come here to witness a drunken man act like a child if I were you I would never step foot in this club. I would also thank the lady who called the cops, and I hope the poor bartender is okay. Wost place to go. Anyway, kind of sketchy. And, really, a fair commentary on the leadership of the Newark Teachers Union: Lots of noise and money and little respect for the 50,000 Newark children and their families, whether they attend selective magnet schools (like Science Park), public charters (regarded as one the highest-performing charter sectors in the country), or district schools. So here’s some advice to Gov. Murphy: If you privilege the needs of students over union leaders, don’t listen to John Abeigon. Previous PostHere’s A Leaked Memo From the NJ DOE’s Assistant Commissioner When She Directed Special Education in Asbury Park. Next PostKing Repollet Goes to Ghana (And Other Misadventures of the New Jersey Education Commissioner). The governor happily cashes their checks.